Coleslaw is not just cabbage and carrot. There are so many ways to dress up coleslaw by adding fresh or dried fruit and nuts. This apple coleslaw recipe has all that. Walnuts and apple give added texture and crunch, while raisins add sweetness. This one also has a delicious dressing made with yogurt, which gives you all the creaminess you expect from a coleslaw dressing without the calories. Place walnuts on an oven tray and toast in the oven for 6 to 8 minutes or until golden. Why toast the walnuts? It gives them extra flavor. Leave them to cool while you prepare the rest of the salad. Now you need to either shred or finely chop the cabbage and carrot. If you have a food processor this is easy. 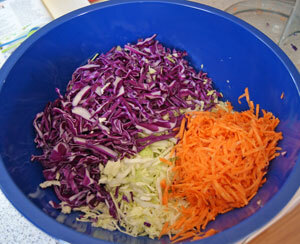 Simply use the slicing disk for the cabbage and the grater attachment for the carrots. How much cabbage do you need? A quarter to a half of a medium size cabbage. Peel and core the apple and either dice or slice thinly. 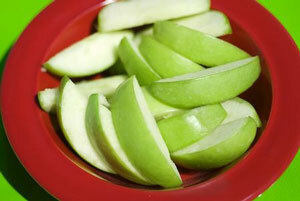 Drizzle the lemon juice over the apple and toss until the apple pieces are well coated. This will prevent the apple going brown and ruining your salad. To make the dressing, place the yogurt, vinegar, oil, salt and black pepper in a jug and whisk until well blended. Or else place the ingredients into a jar with a screw top, then give a vigorous shake. To assemble your salad, place both the red and green cabbage into a large mixing bowl. Add the carrot, walnuts, raisins and apple. Drizzle the dressing over the salad and toss well. Now your apple coleslaw is ready to serve. 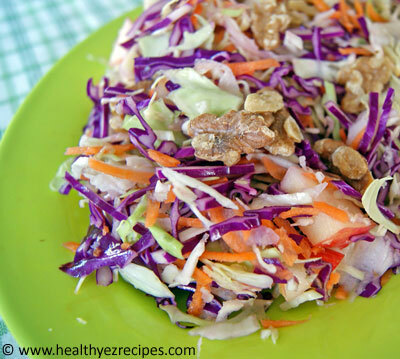 This apple slaw is ideal for barbecues, picnics or luncheons. A tart apple, such as Granny Smith is recommended for this recipe.